Eph 6:19 And for me, that utterance may be given unto me, that I may open my mouth boldly, to make known the mystery of the gospel. We Hope You Have a Blessed 2019! Welcome To Cedar Hill Rottweiler's! We are are small kennel nestled in the Cedar Hills of Okolona Arkansas. We have selectively chosen our dogs to fit into our family and we breed with that goal in mind; to produce powerful ,gentle, intelligent and beautiful Rottweiler's capable of being the perfect family member. We breed for the total Rott, a dog that embodies breed type, working ability, and sound temperament. We obtained passing health clearances prior to being breed. Our puppies are raised with loving care and well socialized. Whether your new puppy is destined to be family pet, show dog or a working dog, it will be part of your life for a long time. We welcome you to come visit our Rotties. Although our dogs are first and foremost our family pets, we do enjoy showing them. We always owner handle and are looking forward to finishing some out of the Bred By class. Please make yourself at home as you browse through our Rottweilers. We hope you enjoy visiting our web site. Our Rottweilers are part of our home and our heart. Inquiries are always welcome regarding pedigrees and planned litters. Give me a call or send me a text! 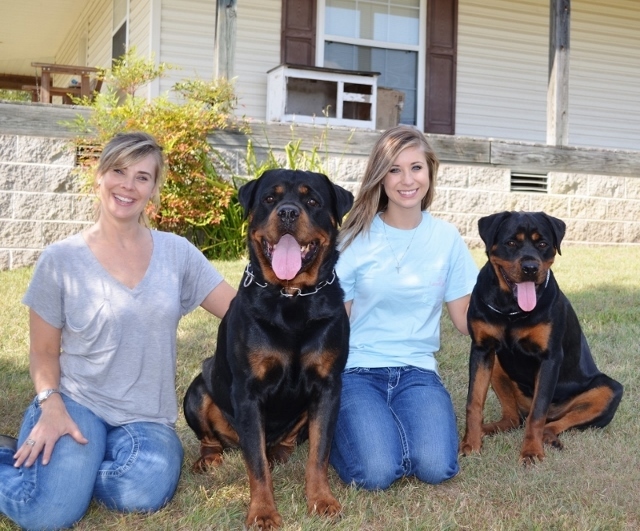 I would love to talk to you about our Rottweilers!